Learn the Byzantine Stitch and create this ART DECO design ‘DECO BYZANTINE’ for PLACE MAT BORDERS AND A COASTER ready for your next chic luncheon or dinner party! TWO MORE CLUTCH BAG DESIGNS ! I used the same purchased pattern I used to make up the clutch bag straps! All you have to do is incorporate the tapestry when you are sewing the clutch bag. Striking primary colours of cobalt blue, and yellow with an accent of a vivid red globe make up this bold and geometric 1930’s CUBIST design! I’ve also designed a second clutch bag flap design ‘KNIFE THROWER AT THE CIRCUS’ for those who love Matisse’s cut-out designs (like me)! Click here to look at and learn more about these new contemporary needlepoint designs. I’d added a new category to the site… NEEDLEPOINT FOOTSTOOLS! First on offer, five classic textile designs from Persia … ideal for creating elegant needlepoint footstools and seat covers. 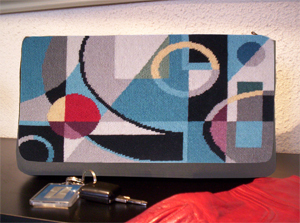 More footstool designs to follow… from Art Nouveau to Abstract! The footstool needlepoint design at right ‘HERIZ-SERAPI’ displays the unique motif from the Heriz region… characterized by cypress trees on a background of terra cotta. 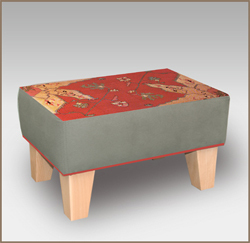 It’s a perfect design for an accent piece like this small rectangular needlepoint footstool! Click here to look at and learn more about these elegant designs that suit both traditional and contemporary homes. On the Shopping Pages, please note prices quoted are in EUROS. I will convert to your currency, if requested, before you order. When ordering, have you found sometimes that the PayPal pages are in French? Please see the Ask The ZIVA DIVA! Section below where I answer the question on how to deal with it and get it translated into English for these pages. The pages are still secure, no matter the language. You can also click here to go to the Terms and Conditions page on the site for how to easily resolve this issue. All the instructions in the kits are automatically in English, unless you specifically ask for them to be in French. I apologize about the one month delay on releasing this ZIVA Newsletter. You’ve been keeping me busy with painting needlepoint canvases for you! Thanks very much! KEEP ORDERING, I’M LOVING IT! The next newsletter will be in the fall, and I’ll issue a blog over the summer on what I’ll be designing for you for free! Keep checking or sign up for the WHAT’S NEW Blog on the site for news about new designs and the next newsletter release date. The 'BYZANTINE STITCH' with its strong zigzag diagonal pattern, creates an ideal Art Deco ‘look’ for 2 needlepoint place mat designs and a matching coaster. I’ve separated the sample charts for the place mat and the coaster so you can practice them separately. The Byzantine Stitch on the coaster is a smaller zigzag than on the place mat, so you should practice them both. 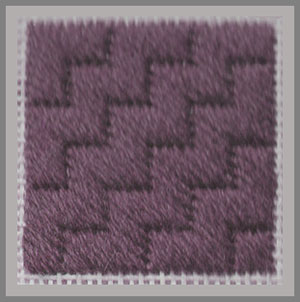 This stitch consists of straight diagonal stitches worked over 3 or 4 thread intersections in a step pattern. Note that the stitch can be worked so the steps and stitches go up to the left or the right. Depending on the design, you can work the stitch over more or fewer threads, and it works well over both even and odd numbers of threads. Study the chart to the right. The chart shows the stitch worked over 4 threads in steps of 6 stitches. NOTE: It very important in your count that the pivot or corner stitch is counted twice. 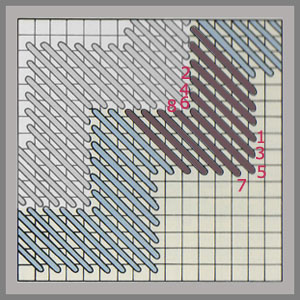 Be sure that you keep the stitches at the same angle throughout, and follow the numbers on the chart. Experiment on a scrap piece of canvas until you understand the rhythm of the stitch. It stitches very quickly, which is a real bonus! These ‘BYZANTINE BOXES’ are a variation that combines the Byzantine stitch with the continental tent stitch. Once you’ve practiced the standard Byzantine stitch above, this one will go just as easily. Study the chart to the right. I’ve highlighted the Byzantine stitch in red and the filler diagonal stitch in the boxes in yellow. Work the Byzantine stitches in steps of 5 stitches down (again the pivot is counted twice) over three thread intersections above and below the tent stitch boxes. Note that the Byzantine stitch is sloped in the opposite direction from the tent stitch. Fill in the boxes with diagonal straight stitches in the same direction as the tent stitch. Keep practicing until you feel confident that you’ve got it! Then you are ready to stitch the free design. 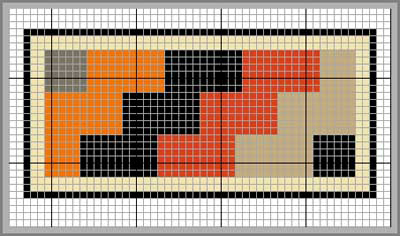 For this design, I used colour accents of autumn yellow and terra cotta. But you could try other colour accents depending on your décor! 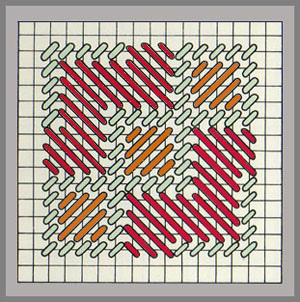 Go to the Byzantine Stitch free designs page for more detail on the design and other colour suggestions. 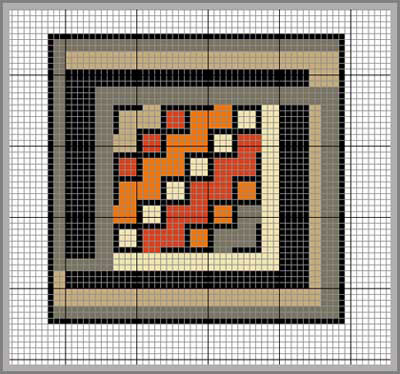 Option # 1: this design option creates 4 corners of a border for the place mat. 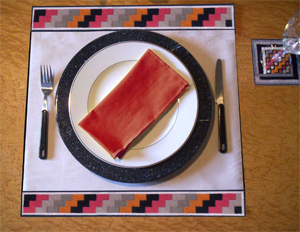 Option #2: this design option creates 2 full length horizontal borders for the place mat. Start with the black and light grey border surround in the tent stitch (3 rows) to create the proper shape and dimensions for the Byzantine to fill in..
Go to Basketweave tent Stitch page if you need a refresher! The rest of the chart is in the Byzantine Stitch, just as you practiced it. If you want to stitch the border longer or shorter, end the stitching in the way it’s shown on the chart. As you can see from the photo at right, the Byzantine Stitch is only used in the centre of the coaster as an accent stitch. The rest of the design is in the tent Basketweave stitch. The overall dimension of the coaster is 4.25” (10.5 cm), perfect for backing it with a 4” x 4” standard cork coaster. See ‘Finishing’ Suggestions below. Note:The stitch count of the central diagonal squares and the size of the Byzantine stitch zigzags are exactly the same as the one you practiced above! Easy! All are readily available at your local needlepoint shop or online. 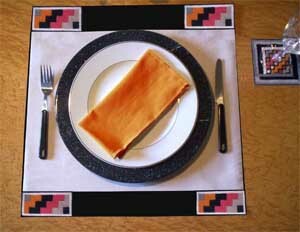 Placemats: Option #1: 10” x 12” (26 x 30 cm) to make 4 corners. As usual, start by putting masking tape on the canvas edges to protect the yarns from getting frayed. Whether you’re making just the 4 corners or stitching the full length borders, you start up the same way. Stitch the black and light grey border in the tent stitch as shown, enough to set the dimensions to start the Byzantine Stitch. 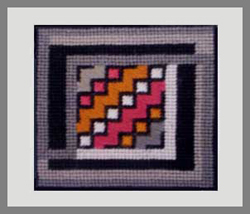 Again, use the tent stitch as your outline and start the border in the grey colours. You can see I used the tent stitch as well to establish the interior pattern, by stitching the diagonal boxes first. Then you just have to fill in with the Byzantine stitch. After blocking the canvas, you are now ready to finish the placemat! 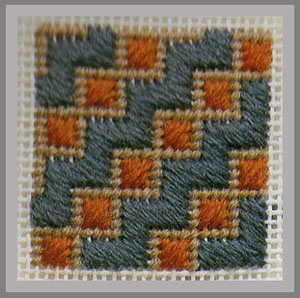 If you decide to stitch just the four corners, finish off the top and bottom borders by sewing black cotton (or linen) bands to connect the corners, as shown. Dimensions to suit the size of your plates or chargers. Sew a strip of Velcro on one long edge of each of the borders. Sew Velcro to the top and bottom of the central panel of the place mat (fabric type and colour of your choice), and fasten to the borders. Line the bands and the central panel separately. Note: I’m suggestion Velcro, instead of simply sewing the central panel to the border, to permit you to remove the central panel for washing, in case it gets stained in use. This option is obviously simpler to make up, because the needlepoint borders run the full width of the place mat. I’m suggest you apply the same method (i.e. Velcro) for making up the full borders in Option #2. Line each piece separately, and then fasten by Velcro just as I described for Option # 1. After blocking the canvas, you are now ready to finish the coaster! Photo at left: Paint the canvas around the perimeter of the coaster (2-3 rows) in black acrylic paint . Centre photo: Turn the canvas to the back, and glue down the loose edges with fabric glue. Stitch the edges using the Loop Edge Stitch with black needlepoint yarn to finish the edge off neatly on the front and back. Photo at right: Glue with fabric glue, a standard size 4” x 4” x 1/8” cork coaster to the back of the needlepoint coaster. Note: I designed the coaster slightly larger to allow for the cork coaster to ‘fit’ within the loop stitch on the back. You’re now ready to set up you table with these dynamic place settings! QUESTION: Hello Sylvia, I have decided to purchase the ‘Cat Blues’ Clutch bag. I would like to purchase on your website but am unable to read in French. How do I get the paysite to read in English? In your Google window, type in 'Google Toolbar'. It's free to download and installs in seconds; just follow the instructions. It includes Google Translate, which when installed in the language of your choice (e.g.English), will translate any page you want from any language. I took the following off the internet, so you'll see what to look for. After you have installed it, a Translate button will show on your toolbar at the top of your page. You can click this button if your PayPal pages on ZIVA come up in French , and order your canvas in English. It’s that easy! This has no affect on the security of the information you provide. Thank you for your question, Julia. I’m looking forward to painting the ‘Cat Blues’ Clutch Bag canvas for you! Still working on more seat and piano benches, chair pads and contemporary footstool designs! I’m also working on some collar necklace designs! Fun to wear! The next VIVA ZIVA! Newsletter #1110 will be issued in October 2011 . Free design: to be announced on my What’s New blog during the summer of 2011.